Jonathan Wells has a hypothesis. He thinks that centrioles function as little turbines that generate a force on chromosomes that can destabilize them and lead to cancer; that's fine, I could see where that might be interesting and might be testable. Of course, he also argues that this idea is driven by intelligent design theory, and I don't see that at all. It's a mechanistic hypothesis about current processes in cells, and doesn't say a word about their history, so even if it is demonstrated to be true, there's nothing in it to contradict an evolutionary explanation for its origin. Wells has been pushing this thing for a while. He presented it in a poster at the 2004 Biola "Intelligent Design and the Future of Science" conference, and published it in Rivista di Biologia (given the reputation of the journal and its editor, that's not a big deal). 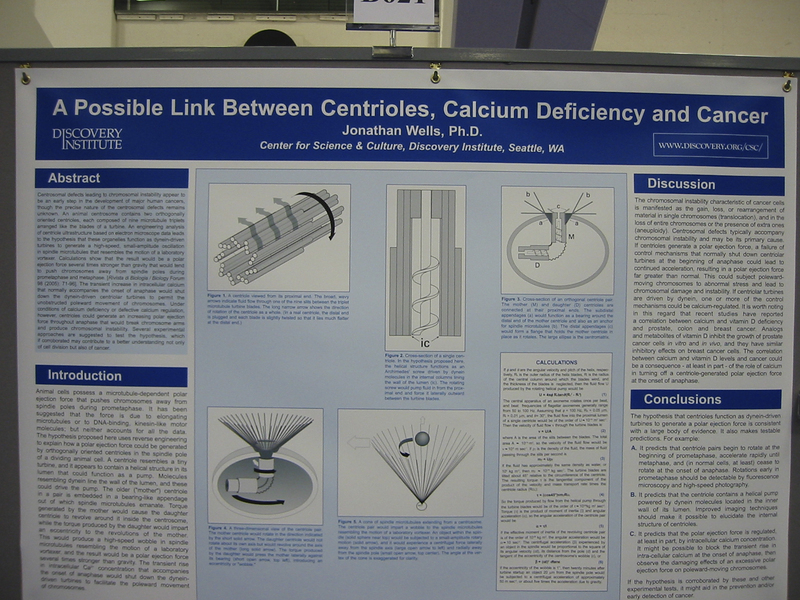 Now he has presented a poster of the "work" at the American Society for Cell Biology, and some attendees have posted photos and their evaluation. It ain't good. They've posted a high res photo of the poster. As an old pro at reading posters on the fly, I can tell you what to do: zip over to the bottom right and read the conclusions first. That'll tell you if it's worthwhile to work your way through the whole thing. The "results", in brief, are "I have a hypothesis. It predicts A, B, and C. If this pans out, it would be good." In other words, there are no results. …well, by comparison, anyway…at least the kid did some work.